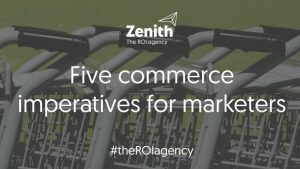 This is the key finding from Zenith’s latest research: Five Commerce Imperatives for Marketers. Traditionally, brands have had separate sales and marketing teams, often with different objectives. Marketing teams need to reach the right customer at the right moment and are measured by awareness and reach metrics. Sales teams on the other hand need to meet ‘sell-through’ targets and are often assessed on short-term sales metrics. As eCommerce ‘pure players’, such as Amazon, gain share and grow their customer base, brands to need to rethink the distribution of their products. Shoppers are notoriously loyal to where they purchase, so brands need to focus their partnerships on a core set of retailers that offer the most growth potential. Advances in data and technology solutions present an opportunity for seamless integration between brands and retailers. In order to leverage these opportunities brands need to connect communications to commerce. One way of doing this is to use retail eCommerce data to optimise a brand’s digital marketing.